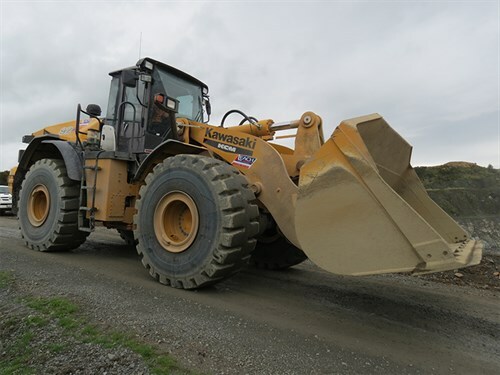 HG Leach & Co Ltd’s Tahuna Quarry is a great place to watch their Kawasaki 92Z7 wheel loader go through its paces. This machine has already proven to be a reliable, powerful, and flexible workhorse for its owners. The first thing you notice about the 92Z7 is its size. It’s a large piece of machinery with a bucket capacity of up to five cubic metres. The 92Z7 measures just over 3.5 metres to the top of the cab, and the bucket can be raised more than 6.5 metres, depending on the loader’s set-up. The 92Z7 oozed smooth, forceful, dependable strength every time it hit a stockpile or moved heavy rocks around the pit. Custom operating power modes, made available through Kawasaki’s IntelliTech operating system, maximise a high engine power rating, which provides power on demand. 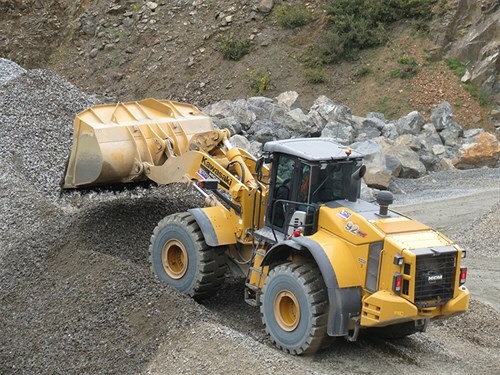 The IntelliTech system uses logic and intelligence to adjust the operating characteristics of the loader. This intuitive system captures every aspect of working conditions and operating demands to adjust the powertrain and hydraulics to best suit each application’s requirements. "We’re pleased with our Kawasaki 92Z7," Corrie Leach, HG Leach’s quarrying operations manager, says. "It’s a powerful, reliable workhorse in the pit and complements the rest of the equipment we have running down there. It can move any type of product and handle a variety of tasks. Just as important, the operators love running it." This sentiment was echoed by Pete Mangan, who was operating the 92Z7 on the day Tough Stuff was at Tahuna Quarry. 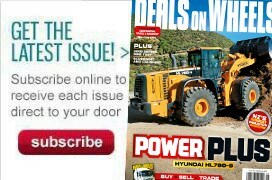 "It’s very comfortable, which you expect with a loader these days, and is easy to operate in and around the quarry," Pete says. for optimum operator comfort, safety, and productivity. The Z7 range’s operator compartment features a low-profile dash, full-length glass doors, panoramic front window, standard rear-view camera, and well-organised storage area. The relationship between HG Leach and MIMICO is strong and long-standing. 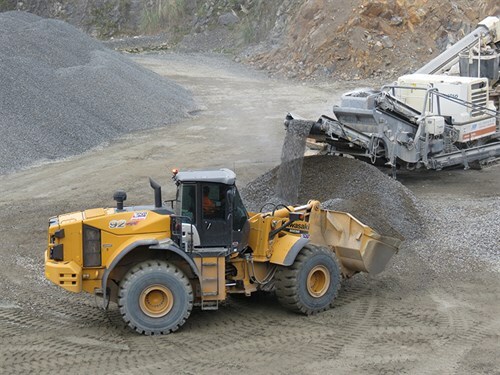 It has been built on the back of their quarrying business, where MIMICO has supplied not only Metso crushing and screening equipment but also backed it up with quality service support and parts supply. to go. They could trust that MIMICO would provide them with a superior piece of equipment along with all the parts and service backup they would need to keep their loader up and running. family-owned business to the best of our ability," MIMICO’s managing director, Rex Davies, says. "Over the years, HG Leach has been able to build up a level of trust in MIMICO. They know we’ll be there for them not only through the supply of top-class equipment but also with everything else they need to ensure their business keeps running." HG Leach has purchased a range of Metso mobile and fixed crushing and screening equipment over the years. The company currently owns and operates two Lokotrack LT105 mobile jaw crushers, an LT200HPs mobile cone crusher, an LT1213S mobile impactor, and an ST2.4 mobile screen. H.G. Leach & Co. Ltd is a privately-owned family company with a 60-year history in the Thames Valley region of New Zealand’s upper North Island. The company operates four quarries at Tirohia, Matatoki, Tahuna, and Waitawheta. HG Leach also operates and constructs landfills for local authorities in New Zealand and Fiji. The company has extended its operations around the central North Island over the course of 60 years. Their reputation for outstanding quality, a strategic placement in relation to key urban markets, and a highly effective transport fleet, have all combined to allow HG Leach to expand its operations beyond traditional geographical boundaries and into areas of high demand. MIMICO is the New Zealand distributor for Metso rock crushers and screens, Kobelco excavators, ZF transmission and drive components, Atlas Copco rock breakers, Kawasaki Z7 wheel loaders, Moxy articulated dump trucks, and Cesco concrete mixer bowls. The company operates a modern heavy machinery workshop, parts store, adjoining offices and training facilities in Matamata. Sales and service branches are also located in Auckland and Christchurch, a distribution centre in Paraparaumu, as well as 15 service dealers across the country. For more information about the Kawasaki 92Z7 wheel leader, visit mimico.co.nz.